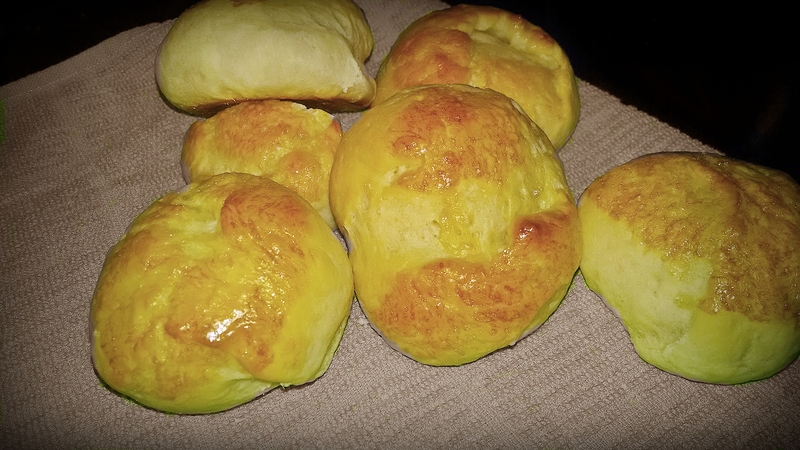 Lately we’ve been trying to perfect our “Farfar’s buns” recipe. Farfar is Danish for grandfather. The name comes from Annette’s grandfather’s reputation for making delicious rolls from scratch for every big occasion — birthday celebrations, holiday dinners and many Sunday brunches. It’s quite fitting that Annette’s brother has been working on his own version. He makes these often (he’s the official bun maker in his family). He even incorporates instant potato flakes in his version. Every one of his five kids loves them. And frankly, who doesn’t love a warm roll right out of the oven? Spread a little butter on it that melts right away, and you taste the crusty outside and then the soft, luscious middle. Ooh, maybe you add a spoonful of blackberry jam – heaven! So we’ve been working on our recipe, which has been rewarding, for the most part. As has happened occasionally with Danish recipes we’ve translated, we ran into some rounding errors and some outright mistakes. One version had 3 times the amount of yeast it should have had and was awful. My bad! But by and large, we’ve been very pleased with these buns. They’re not difficult, they’re very satisfying and they’re great comfort food. In a large bowl, mix the yeast with the milk. Add the melted butter, sugar, and one egg, mixing well. Add 2 cups of the flour and mix with a large spoon until dough is glossy. Sprinkle the remaining flour over the dough. Place a kitchen towel over the bowl and allow the dough to rise for about an hour to an hour-and-a-half. Dough should have doubled in size. Using the large spoon, work the loose flour into the dough. On a lightly floured surface, knead the dough for several minutes. You may need to add a little flour to the surface as you’re kneading so the dough doesn’t stick. Let the dough rest again, covered, for 15 minutes to one hour. Gently deflate the dough and let it rest for another 10 minutes. Preheat oven to 425 degrees F. Prepare a baking sheet with parchment paper or cooking spray. Mix the remaining egg with one teaspoon of water to make an egg wash. Coat your hands with olive oil or butter. Holding the dough with one hand, squeeze off one ball at a time, as uniformly as possible, and place on the baking sheet. Brush each bun generously with egg wash. Bake for 15 minutes, or until they are light golden brown. Watch the buns closely so they don’t get too browned.